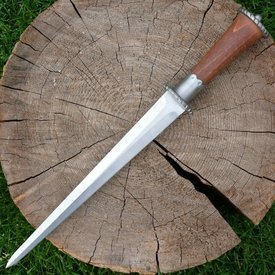 The roundel dagger is a dagger with a pointy shape and a round grip. It is provided with two round discs for protection of the hand, as a result its modern name is roundel dagger. The roundel evolved around 1300 and was mainly used between 1350 and 1500. It was very popular among the people from the social classes between knight and king. Members of the aristocracy are often depicted wearing the roundel dagger on the right side of the belt. The roundel dagger was mainly used in central and western Europe, Scandinavia, Spain and England. Several 15th century sources describe how the roundel dagger can be used in battle. 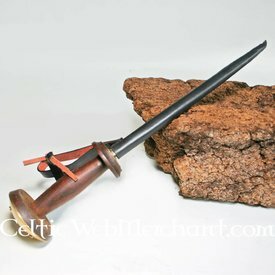 This roundel dagger has a leather grip that can be made in the colours un-dyed, brown and black. Its length is 32 cm and it has a blade of 19 cm.